As others have mentioned, Fake Profiles Are Killing LinkedIn’s Value. The few fake invites I receive are generally easily to spot, for example because they use a private e-mailaddress from a known spam-domain such as mail dot ru, or because the profile is filled with spelling errors. Peter’s profile looked okay to me. Granted, I didn’t know the guy personally, but as a journalist it’s often impossible to remember whom I’ve been in contact with through e-mail, chat, at a conference or on a social network. Generally I do not connect with people I do not remember at all, but since Peter had 500+ connections, was a paying Linkedin Premium-member, which sets you back between 226 and 899 euros a year (sales tax not included), and even shared one connection with me (whom shall remain unnamed), I decided to accept his invite. A subtle offer indeed. This screams spam, phishing, I know not what. 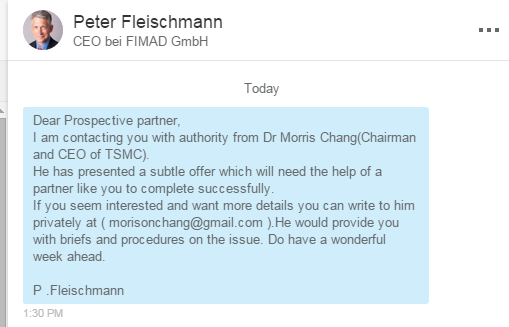 Dr. Morris Chang and TSMC are very much real, but I sincerely doubt that the founder of the Taiwan Semiconductor Manufacturing Company Ltd. would want me to contact him through his gmail.com address, which he probably doesn’t even have, and use the CEO of a small German consultancy company as an intermediate. A reverse image search gives the scam away. “Peter Fleischmann” uses the picture of Dr. Shaun C. Williams, an endocrinologist from Connecticut. 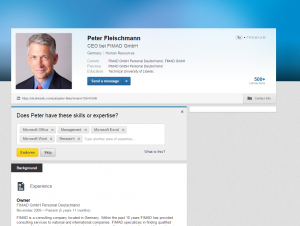 The person(s) responsible for the fake Linkedin profile of “Peter Fleischmann” probably stole his picture from Dr. Shaun’s bio at RMA. I responded to Peter and asked him to give me some more details about his “subtle offer”, but I haven’t heard back from him. I do not dare to send a message to the fake gmail-address, so the precise nature of this “offer” shall remain a mystery to me. You can report profiles with inaccurate employment or education information, or a profile that is impersonating someone with the Linkedin Notice of Inaccurate Profile Information form. 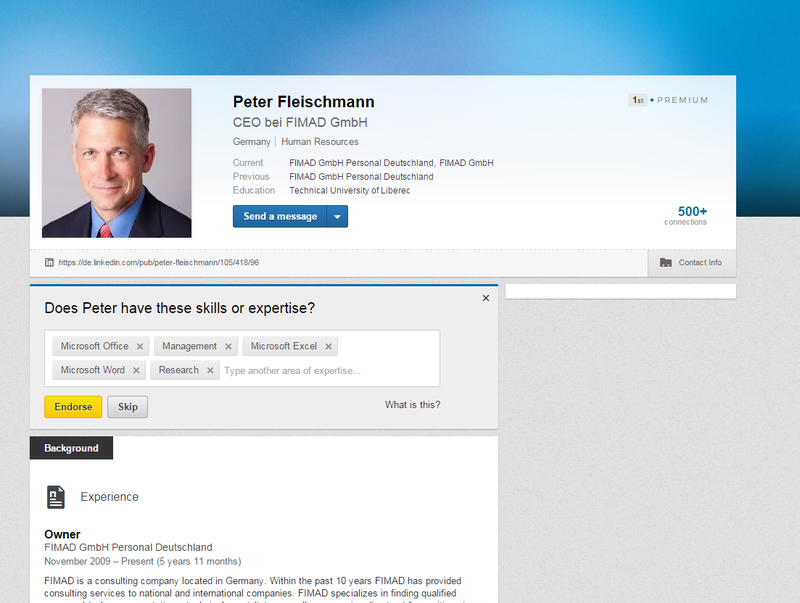 I have done this for “Peter Fleischmann” and am awaiting Linkedin’s reaction. According to Facebook, between 5,5 and 11,2 percent of its members are fake. Linkedin hasn’t reported such statistics, but if the same ratio applies and based on Linkedin’s 300 million plus-user base, between 16,5 and 33,6 million of its users are fake.